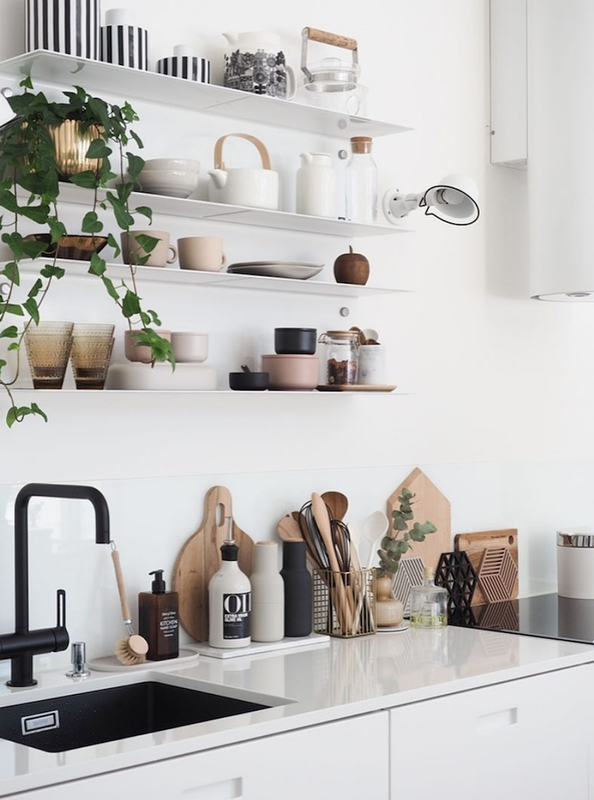 In the kitchen, sleek, white kitchen cabinets from Finnish brand Topi Keittiot (IKEA sells similar) are broken up by a black mat faucet and sink (both Tapwell) . 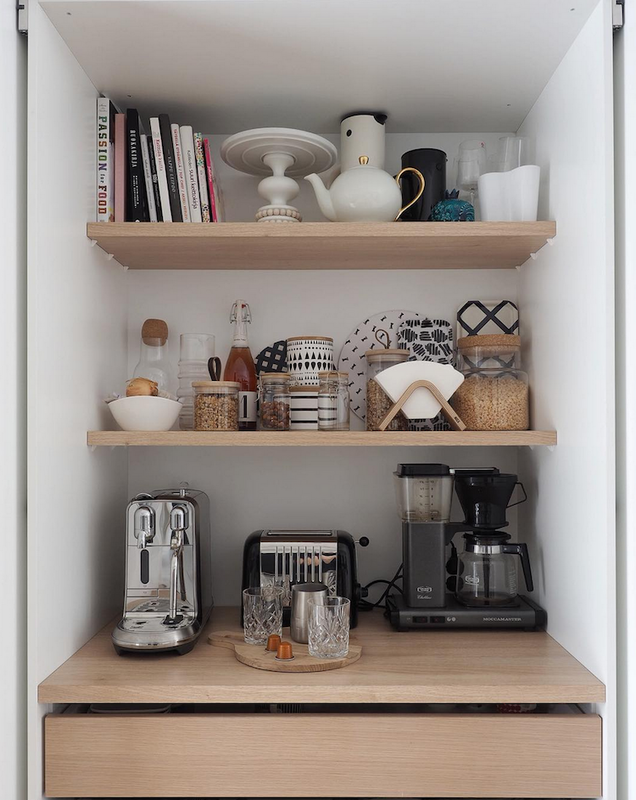 The shelves above are laden with ceramic and glassware including the classic Oiva Stoneware Teapot* by Marimekko (loving the gentle silhouettes). 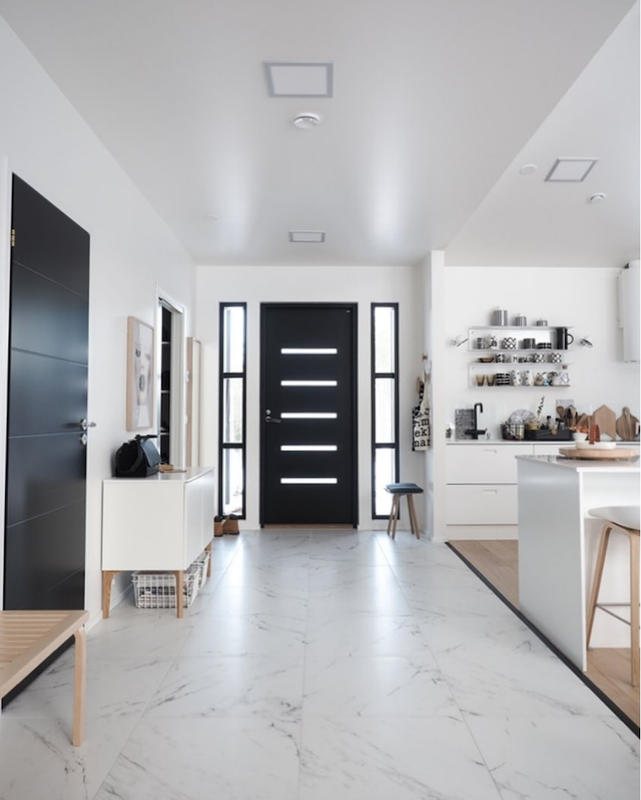 I like how Sini has combined marble (the large square tiles are from Tarratinta) with wood flooring to create a distinct kitchen zone and add a lorry load of warmth! I'm not sure if you're thinking what I'm thinking: how about stubbing a toe in the night?! On closer inspection however, it looks like the wood floor has a soft gradual edge. The oak bar stools are from Hay and the lights are the Artek A110 pendant (FYI!). 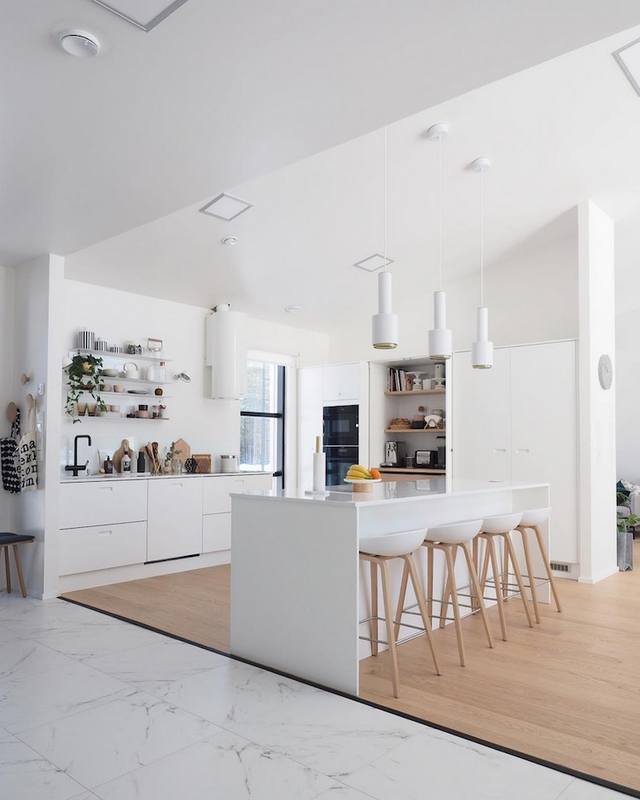 "I think our home is quite a typical modern Finnish house. Nowadays people like to build modern houses with big open spaces, large windows and minimalist shapes. Although, I still think our home is quite unique and looks like us." 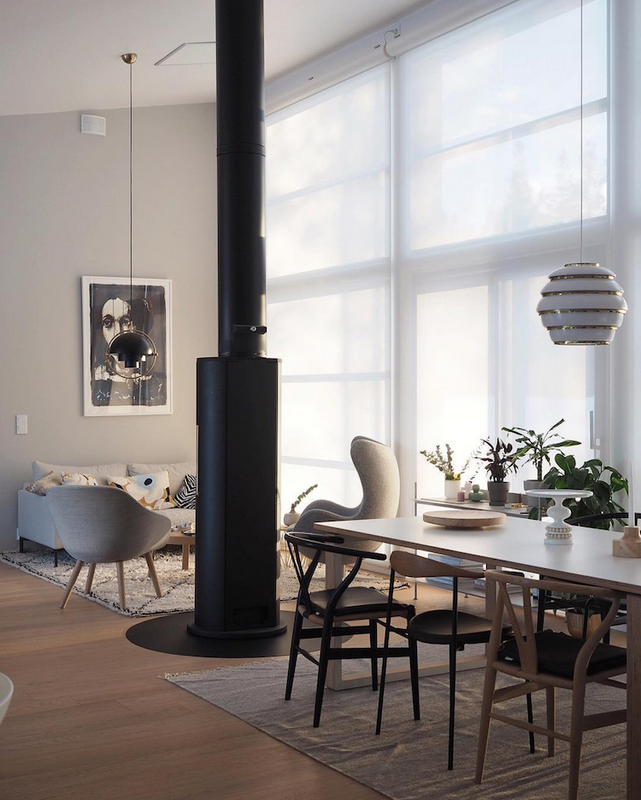 The family dining area includes some real Scandinavian classics including the Artek beehive light and wishbone chairs. I like how the inclusion of a black chair balances the dining area with the black door behind (US readers - check out Target's budget friendly look alike!). 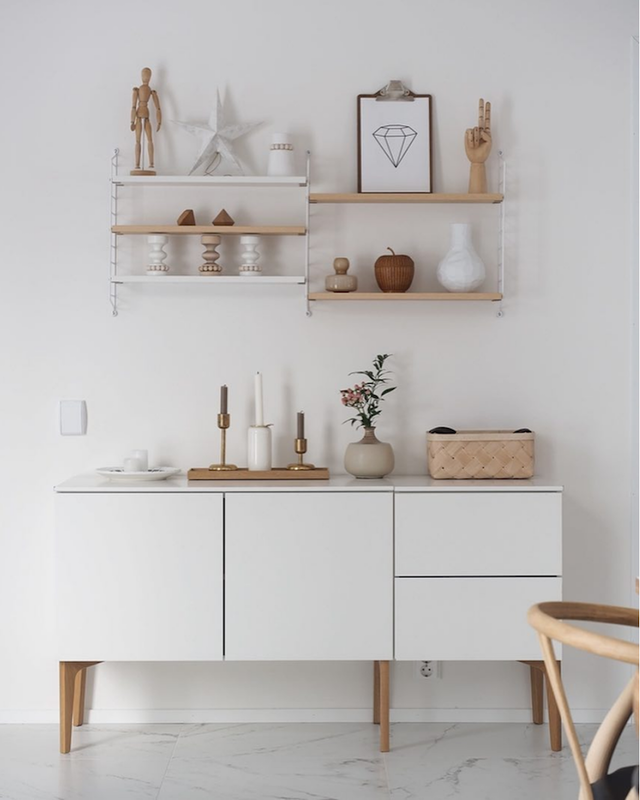 The white storage cabinet in the background (and below) is by Finnish brand Lundia. "The best thing about our home is that we have a big open space which incorporates a kitchen, dining room and living room. It means we can all be together as a family but there is still enough space for everyone to do their own things if needed." Despite the open space, Sini has created a cosy spot for the family to relax (I bet it's even toastier when the fire's going!) 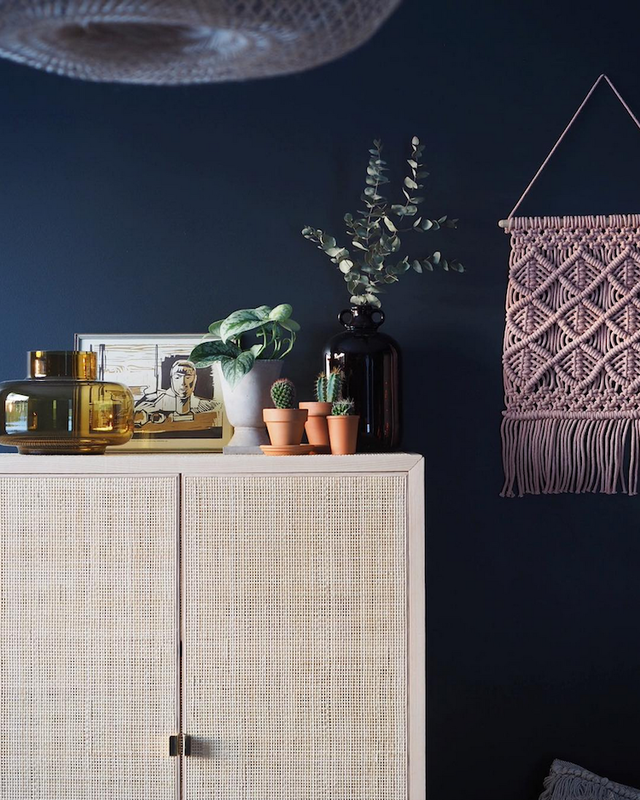 using layers of textiles (including a Beni ourain rug), plants and a raft of new nordic design pieces such as a pink Ferm Living Plant Box (I've got my eye on that, how about you?!) and the Around coffee table. "I think that the best interiors come with time, and years bring different interesting layers to it. I usually buy furniture that I hope will last decades and tell the story of our home to our visitors." "Every interior guide says that all the rooms should be in 'perfect harmony' with each other to create a complete look. I am quite a 'safe' decorator who loves neutral tones but I wanted to have one room with a completely different look." 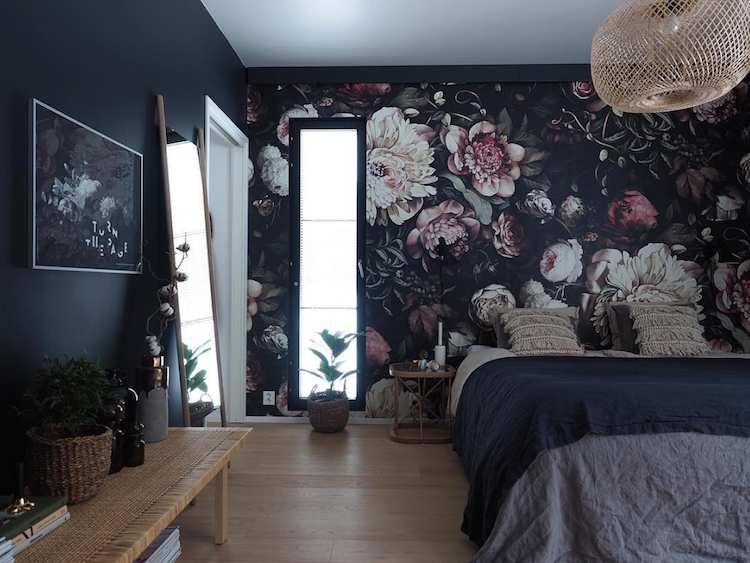 To achieve the darker look, Sini covered the back wall with bold floral wallpaper from Ellie Cashman Design (if you have the time you must check out this insta feed!). The rest of the room has been painted in Stiffkey Blue from Farrow & Ball. 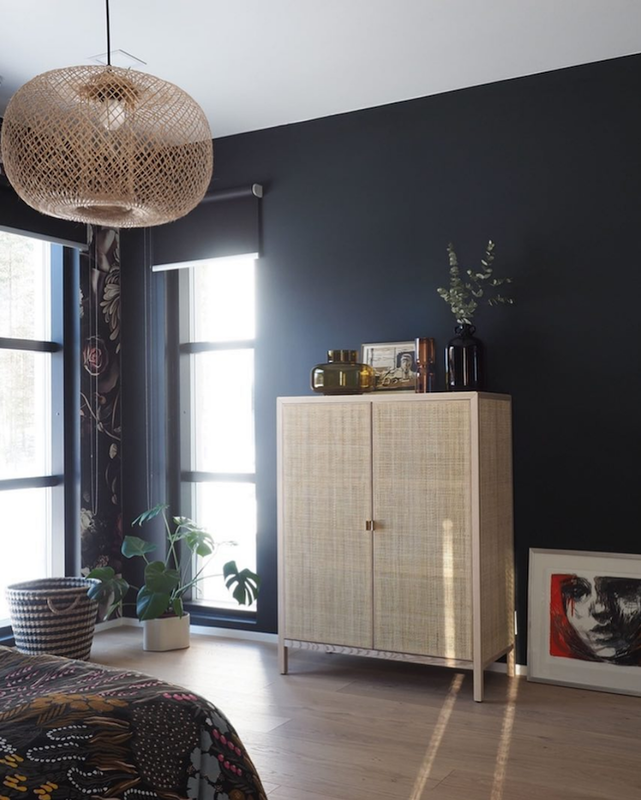 A rattan pendent from Bloomingville, and an IKEA bench and cabinet add a soft, light touch to the overall look. "I really love our bedroom because it's like going to a completely different land! It's dark and kinda romantic and that's what I like in a bedroom. People are always so surprised when they enter the room! They're like "wow! this is awesome!" it's not what you'd expect from our home when you look at the other rooms. And that's why I love it so much, it's my hidden flower garden." 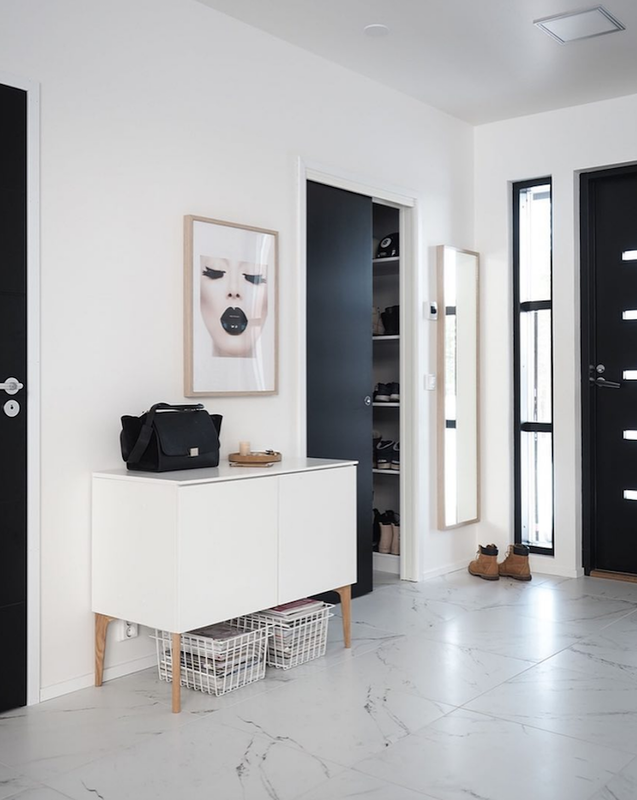 "We have black window frames so I figured black doors would go well with them. I also wanted to add an 'edge' to the interior since most of our walls are white. I have not regretted them, I love them!" Thank you so much for inviting us into your home Sini! 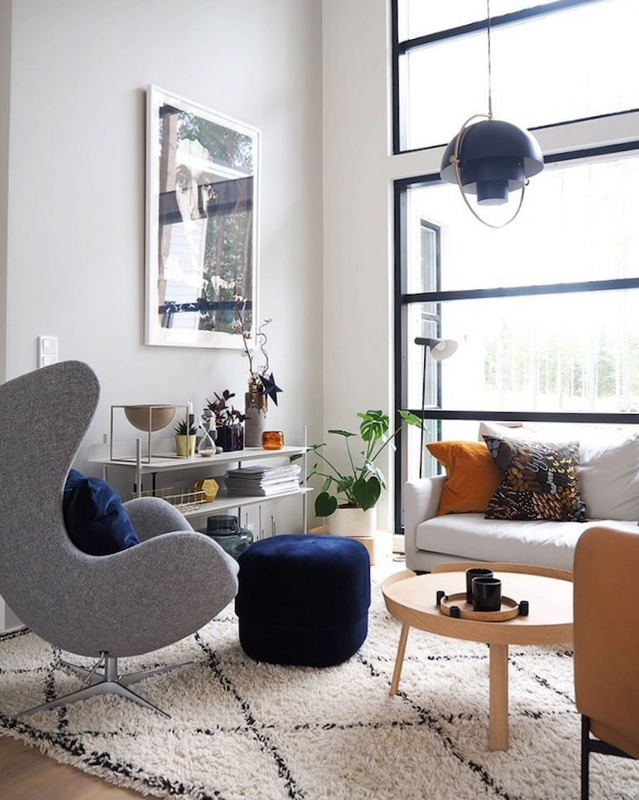 Love that you have broken the design rules and followed your heart - that's what makes a house a home - don't you think? If you'd like to know where more of the items give me a shout in the comment section below and I'll do my best to help. Sini is also great at tagging her images over on instagram, so you can always check there too (and see more of her home over on her blog!)! 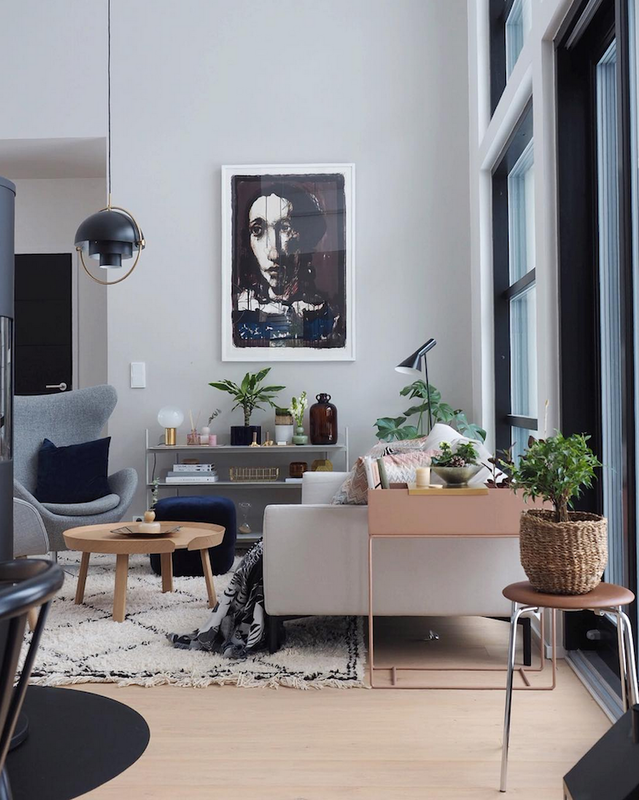 If you fancy taking a peek at more homes in Finland today, how about this home in a converted factory, a living space where old meets new and the calm Finnish home of Anna Pirkola. 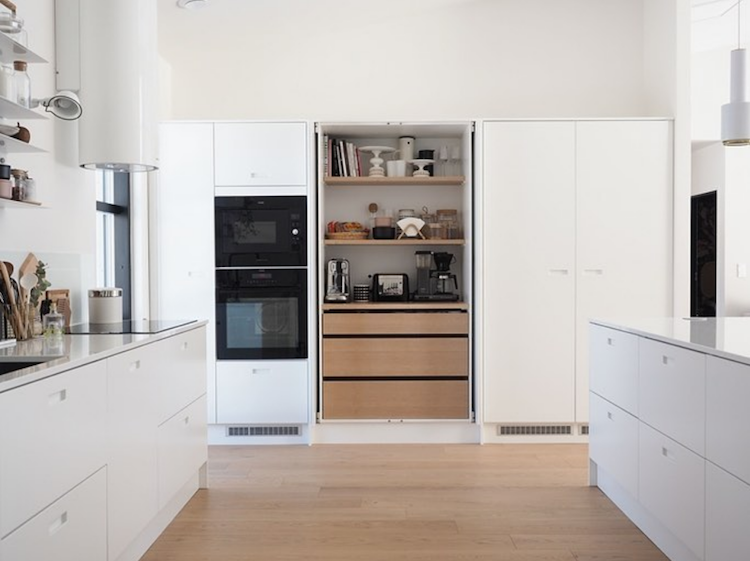 Yup, the Finns know what they're doing when it comes to interiors! A little bit of Finnish trivia for you too - did you know that when a baby is born in Finland they are given a box which includes every single item thing they might need for the best start in life? The box itself is designed to be slept in too! You can find out more about what it contains and why they provide it here (it makes for a fascinating read!). All photography © Sini Liikala shared with kind permission. *My Scandinavian Home posts include some affiliate links.